Don’t let the name fool you- there is no cornmeal and it’s not a cake. More like a brown sugar blondie. It is very yummy and super easy. The recipe came from a dear friend of the family who is also one of the deacon’s wife. Preheat oven to 350 degrees. Spray or grease a 13Ã�9 baking dish. In a large bowl mix all ingredients together in order given. The batter will be thick. Pour into prepared baking dish and bake for 30-35 minutes or until tester comes out with fine crumbs. Cool slightly or all the way depending on how patient you are. The name fooled me. It sounds really good. 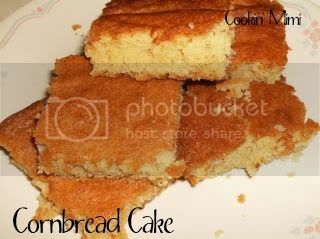 Why is it called cornbread cake? Is it because it looks like cornbread? From what I can find it’s because the nuts are supposed to be finely ground and that’s supposed to give it a grainy texture like cornbread. I’ve never used ground nuts actually I rarely use nuts in it at all because it’s just as good without them.